Quiet Places of the North Fork, a new series of paintings by North Fork artist Diane Alec Smith, opens today in our Gish Gallery, thru Dec. 22. WWI Centennial Exhibit: Over Here, Over There: Long Island & the Great War, in our Grand Staas Gallery, thru Jan. 2018. 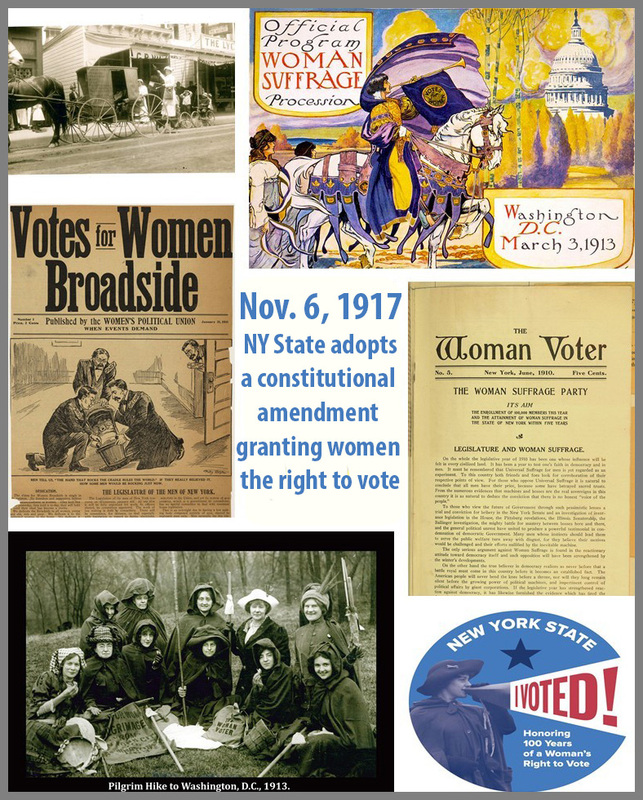 Votes for NY Women Centennial, in our History in Hall Gallery until Dec. 22. Thursday, November 16, 2017 Brooke Kroeger, The Suffragents: How Women Used Men to Get the Vote. 6:00 PM. On November 6, 1917, New York's male voters headed to the polls and voted in favor of a state constitutional amendment granting New York women the right to vote. Monday will mark the 100th anniversary of that amendment to our state constitution, which was overwhelming approved by a margin of 53.92% to 46.08% statewide. In New York, as in the rest of the United States, however, the road toward gender equality was not easy. Women had very limited rights when the new nation was founded, and it would take decades for the foundation of the women's movement to form. As with other social justice movements, it's easy to forget that women's right to vote was neither inevitable nor quickly won. But by 1917, New York's successful referendum helped set the stage for the adoption of the 19th Amendment nationwide three years later. 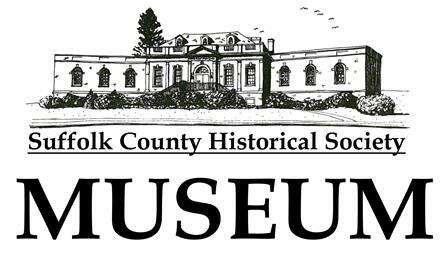 The 100th anniversary of women’s suffrage in New York has been marked by the Suffolk County Historical Society Museum's exhibit and programs, including our “Votes for New York Women: A Centennial Exhibit” profiling Long Island women involved in the suffrage movement, and the upcoming book talk on The Suffragents by Brooke Kroeger later this month. On Tuesday, Election Day, at your polling place, look for the official centennial sticker, "I Voted! Honoring 100 Years of a Woman's Right to Vote," which features the image of Rosalie Gardiner Jones, one of Long Island's most noted suffragists. 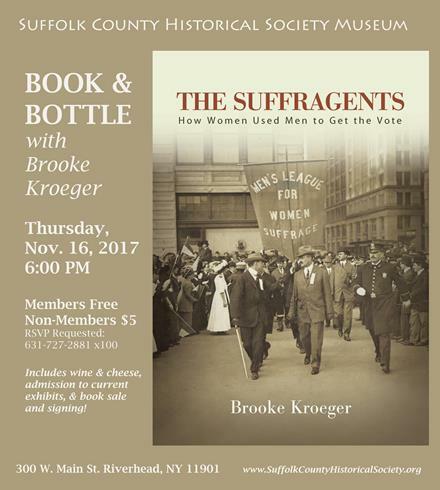 Brooke Kroeger's new book, The Suffragents: How Women Used Men to Get the Vote, will be the focus of a BOOK & BOTTLE talk on Thursday, November 16, at 6:00 PM. 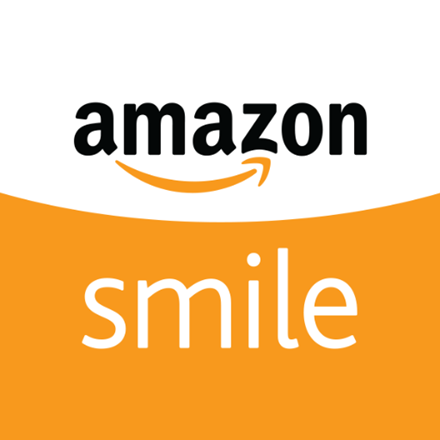 Members Free; Non-Members $5. Includes wine & cheese and book sale & signing. Space is limited! Call soon to reserve: 631-727-2881 x100.